The number of exoplanets being found orbiting other stars continues to grow at an exponential rate; the current number of confirmed exoplanets now stands at 692. Plus the 1,235 additional candidates from Kepler (so far!) that are awaiting confirmation. Now six more have just been added to the confirmed list, a system of three planets found by Kepler and another system of three planets discovered (or re-discovered as outlined below) by the Hubble Space Telescope. Kepler’s new planetary trio orbit the sun-like star Kepler-18, which is only 10 percent larger than our sun. One of these is a “super-Earth” about twice the diameter and 6.9 times the mass of Earth, called Kepler 18-b. It’s very close to its star, taking only 3.5 days to complete an orbit. The other two, Kepler 18-c and Kepler 18-d, are both Neptune-size worlds about 5.5 times and seven times the diameter of Earth. What’s unusual is that these two planets seem to interacting with each other in a kind of “orbital dance,” alternately tugging and pulling on each other. They take about 7.6 and 14.9 days to complete an orbit respectively, so all three planets are in orbits that are much smaller than Mercury’s in our own solar system. 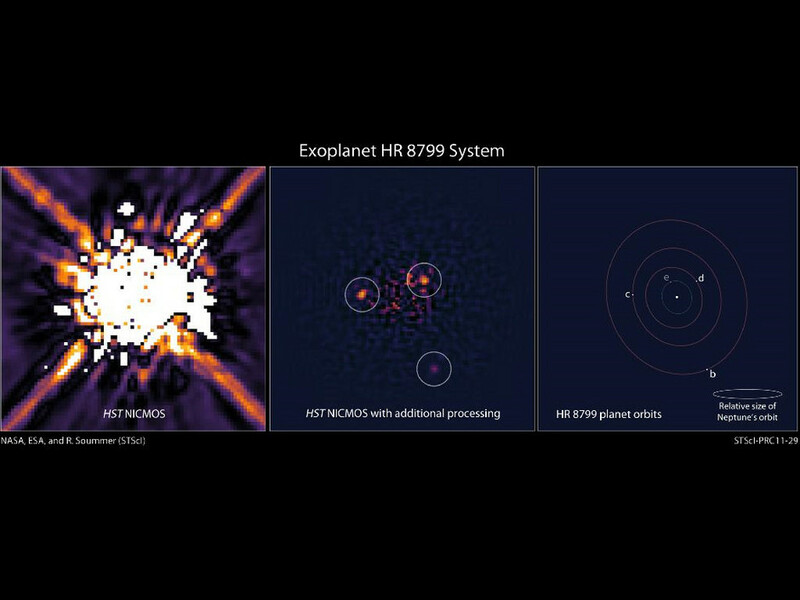 Meanwhile, the Hubble Space Telescope has imaged three planets orbiting the star HR 8799 (a small but growing number of exoplanets have been directly photographed so far). The interesting part is that these planets were actually known to exist already, but they didn’t show up in the first images taken by Hubble back in 1998. But now, using more advanced techniques, astronomers have been able to tease them out of the data in those original photographs after all. There are actually four known planets orbiting HR 8799, but the fourth one hasn’t been imaged yet. (Note: the Space.com story linked to above mentions two planets photographed in the text, although the image itself shows three and this is the number quoted in other articles about this, such as DiscoveryNews).